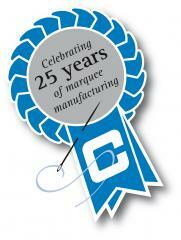 At this year's Showman's Show on October 21st and 22nd at the Newbury Show Ground , Custom Covers, the UK's largest marquee manufacturer, celebrates its 25th birthday by throwing a party for all its customers. "25 years is a significant milestone in anybody's history" says Chief Executive Robert Sanders. "The party is a way of thanking all our customers who have supported us over the years. We have prospered for a quarter of a century by focussing relentlessly on what our customers want; quality, value for money and good service". The Company's 25 year milestone is a testament to how well Custom Covers have done just that, focused on what customers want. In these tough times it's what people are looking for and is why Custom Covers looks forward with confidence to the next 25 years. The Company is launching the stunning 9m Tri Cone: a triangular tensile roof cone to complete the family of 6m, 9m and 12m tensile roof cones. The whole family of cones will be on display at the show this year. Also new at the show is the Cruciform roof which is a PVC roof that joins a 9m structure to a 9m structure at full height with a 90 degree angle with no gutters. New to the show are CQ Therm insulated linings: a temporary insulation product which satisfies NATO field requirements and in the right conditions can save 2/3rds of your heating and or air conditioning diesel bill in a temporary structure. Two new colours: olive green lime green to add to our edible colours decorative linings range. New vestibule door entrance , an innovative addition to the existing door and entrance options. Air tensioned roofs and walls, a walling and PVC roof solution that gives you the tautness of a solid wall at a fraction of the cost. The exhibit will feature the complete range of Custom Covers marquee structures: 3m, 6m, 9m, 12m and 15m all in one marquee. The show stand will feature the full range of pleated, flat, tack off and starlight decorative interior linings.